It's half term week here in the UK following the long Jubilee bank holiday weekend and the weather has been somewhat unsavoury, it is uncharacteristically cold for June and rather wet! So yesterday when we went out to play at the local park with my three and a group of their friends because the council had put on a Olympic Sports activity day, we had good fun I soon became the bowler in a game of rounders, the children tried their hand at long jump and Tennis amongst other things and despite the drizzly weather everyone had a good time. We returned home along with several additional 10 year old boys all rather hungry. So I mustered up a quick snack for them, remembering the Tilda Kids Rice we were sent to review a few days prior I thought this was an ideal time to give it a go. The Tilda Rice kid pouches come in several flavours including Sweet Vegetable and wholegrain rice, Sunshine Vegetable, Mild Curry and Cheese and Tomato. Each pouch is 125g which is a handy snack size. 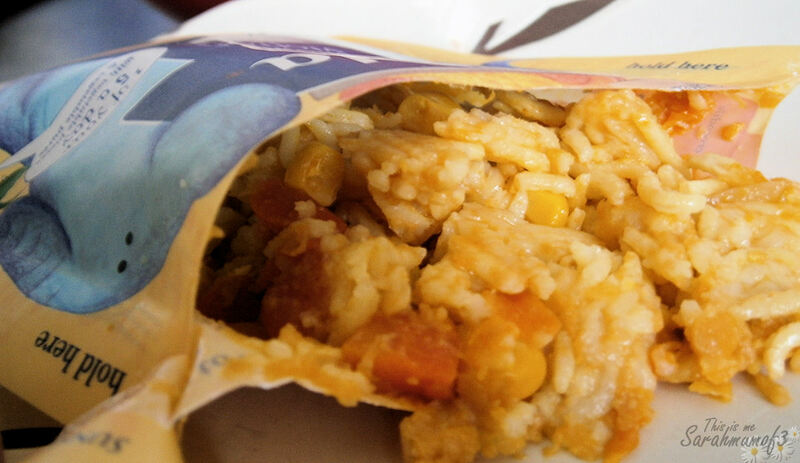 The pouches can be microwaved, but if like me you don't have a microwave they can also be cooked in a pan on the hob, with a bit of water you simply heat the rice up for 3 to 4 minutes. Each pouch contains 1 of your 5 a day portions of vegetables which is made up of vegetable puree and vegetable pieces. I decided for a quick snack to make some sweetcorn on the cob, a selection of Tilda Rice and some potato waffles, everyone tucked in. The Sunshine Vegetable rice was the favourite followed by the mild curry, which was very mild, which is great because my three are not kean on strong spices, but some of the other 10 year olds would have liked a spicier curry. Cooking was quick and easy which makes these a perfect snack or a great accompaniment to a meal, the fun packet design is sure to attract younger childrens attention too with Tilli the elephant featured along with other animal friends. The tasty flavours give a good variety helping get fussy eaters to enjoy something abit different. Overall I was impressed with these pouches they really are a great quick snack idea, they are available from good retailers for around £1 each, everyone here loved them and the only thing left was empty plates. We were sent a selection of Tilda Kids rice to review, all opinions however are our own. oooh they look yummy! and very handy!